Adoption Record of 12 in one Weekend!! This past weekend not only at Petco in Bartlett did we adopt 7 dogs and 1 cat but we also had these adopted as well. Giving Good Dog Rescue a new record of 11 dogs and 1 cat adopted in one weekend! That’s a total of 12 forever pets adopted! Good Dog Rescue Rocks! 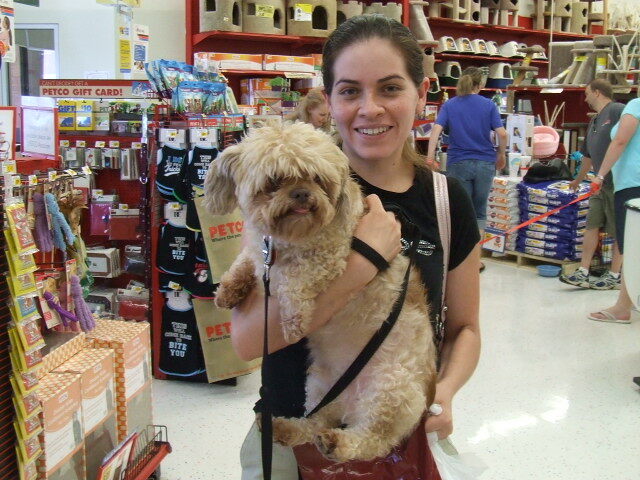 Stripe went home that day with a foster parent and “Bonnie,” a GDR adoption and they decided they would like to adopt him. Earlier that day someone who drove up from Alabama adopted “Kell and Cody”. 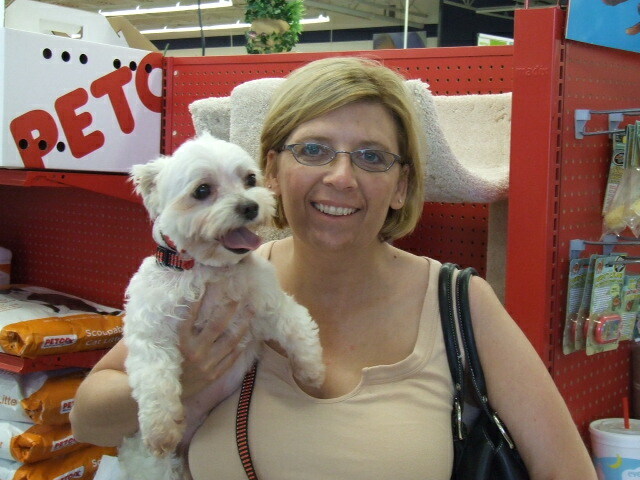 And Sunday “Ollie”, the westie was placed in his new home. Next Sunday, June 15 we are at the Petco at Poplar/Highland from 1-4P. 7 Dogs + 1 Cat Adopted Saturday!!! Wow….we barely got set up and people were everywhere wanting to adopt or look at the pups. It was a great feeling…but a busy one. 7 forever friends got to go home to their new loving families. A man came in frantic that he had found a kitten that morning and his family was allergic….so we took the cat and sure enough somebody adopted the kitten right away. Thanks! I bet all the pups are happy at home tonight getting to know their new family. 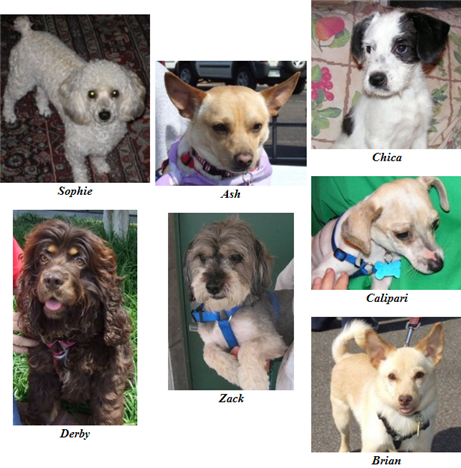 These are the dogs that got to go home: Shayla, Junie, Willow, Sandy, Richard, PJ, and Bear. Thanks to all who adopted ! 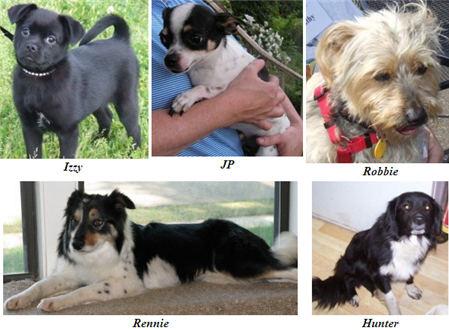 SEVEN puppies and dogs adopted to 4ever homes! 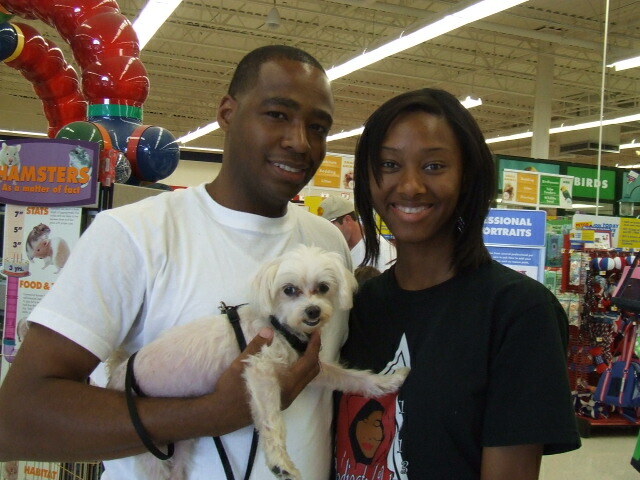 What a wonderful birthday present for Good Dog Rescue founder, Lisa Trenthem, as 7 of our great dogs and puppies were adopted in a span of 3 hours at our regularly scheduled Bartlett Petco adoption event on May 17, 2008. 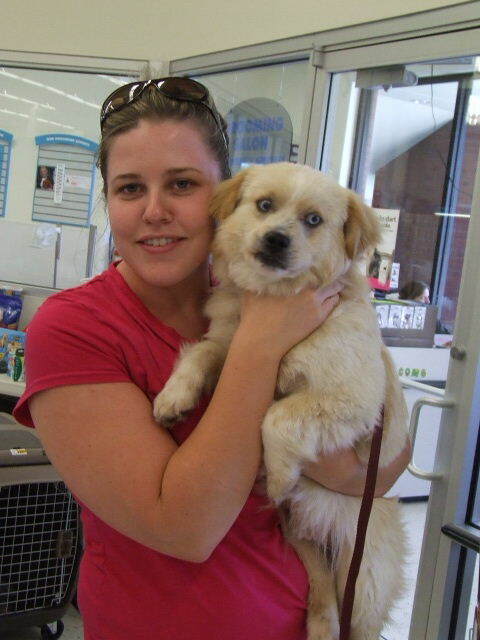 Read the stories below to see the happiness that these adoption events bring to so many people. We’d love to have you join us at our next adoption events. Saturday May 24th we’ll be at Ben & Jerry’s at Poplar & Mendenhall from 12-4pm. 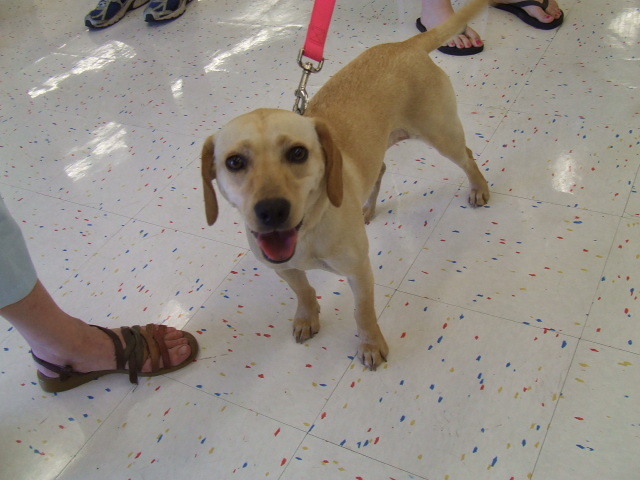 Sunday May 25th has us at our regularly scheduled Petco adoption event at Poplar & Highland from 1-4pm. See our website for exact locations, maps, and telephone numbers. We were adopted … and we’re ecstatic! Adoption Day at Petco Bartlett and B’day Wishes! Birthday Wishes to Momma Lisa….we celebrated again at Petco at Bartlett adoption day with cake and a great birthday sign. 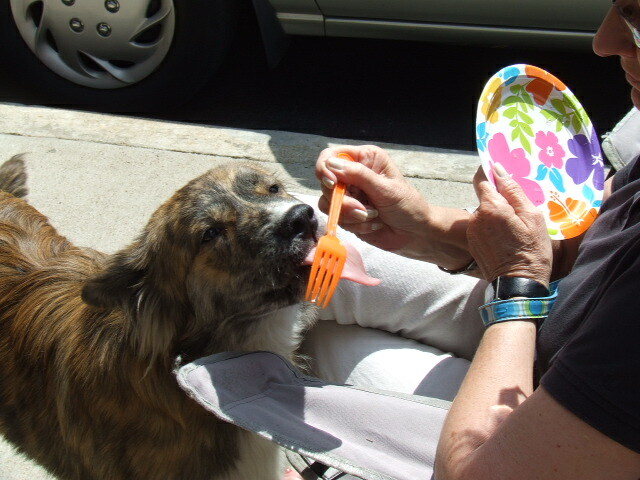 Bright sunny busy day for adoptions….but “Stripe” took time out for a quick bite of cake…mmmmgood! Six great dogs (and puppies) go to their FURever homes! Bartlett Petco does it again! They provided us with a great location for our Saturday, May 3, 2008 adoption event and six of our lovely dogs and puppies are adopted into loving homes, including Hunter, Izzy, JP, Pixie (no pic of Pixie), Rennie, and Robbie. It’s always a great day for the volunteers of Good Dog Rescue when we can see that these loving puppies and dogs are welcomed into a family’s life. It’s what all of us work so hard for! Please let us know if you have adopted one of our great dogs or puppies and would like to share your story. Email us so we can get it posted – along with some pictures if you have some to share! Rennie is a lovely border collie who was rescued from the Memphis Animal Shelter after being found as a stray. She had been well-trained by someone, because she obeys commands, is housetrained, and uses the doggie door to go outside. Rennie had a rough go of it early on. 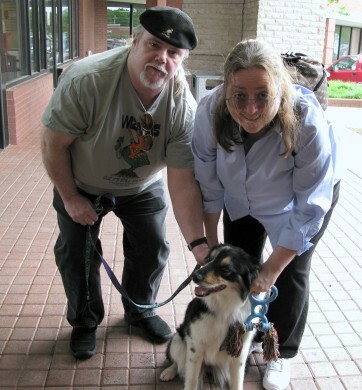 When rescued from the shelter, volunteers Jerry and Cindy heard about her plight and offered to open up their home to her. Jerry and Cindy had failed Fostering 101 earlier in the year and hoped to pass successfully this time! Rennie was a sick young dog when she came into Jerry and Cindy’s home. She had an infection in her suture area. Thankfully Dr. James Pearce of Stage Road Animal Hospital diagnosed her, provided appropriate treatment, and got her on the road to recovery. Rennie was so thankful to be feeling well again! Tom and Syd saw Rennie’s picture on the Internet and immediately made an application to adopt her. They showed up bright and early at Saturday’s adoption day at the Bartlett Petco and were absolutely smitten with Rennie. They’ve done some work with dogs in obedience programs and realized Rennie’s excellent skills. Rennie took to them rapidly – she has this way of knowing who are good folks … and these two seemed like great folks … ones she’d be excited to please for the rest of her life. Rennie joins a family with a couple of cats and we’re not sure how she’ll do with the cats! But Rennie is always up for a new adventure in a loving home. Good luck, Rennie, Tom, and Syd (and the rest of the family)! Note from Good Dog Rescue: Rennie’s situation highlights the lengths that rescue organizations go to in order to help abandoned, abused, and unwanted dogs find great homes. Rennie’s treatment and shelter fees were approximately $800. This is an expense that is often borne by the rescue groups. Your tax deductible donations to Good Dog Rescue help to defray some of these costs, making it possible to continue helping these precious animals who ask so little of us, but give so much of themselves to make us happy. Thank you for everything you do to help us help them.